The Complete Edition contains no DRM. Individual versions of the game include SafeDisc v4 DRM[Note 1], but it can be removed through patches. Complete Edition. 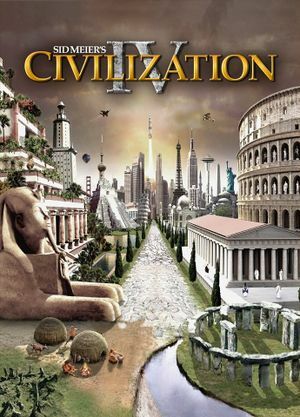 Includes Civilization IV: Colonization. All versions available, including Complete Edition. The Complete Edition contains the base game, Warlords, Beyond the Sword, and Colonization on a single DVD. It contains an updated DirectX installer and contains no DRM. The individual games still require patches to the current version. The tutorial for the game is only available through the base game installation, and the Warlords expansion contains exclusive scenarios which are only available through its installation. All other gameplay contents and features are included in Beyond The Sword; if you do not need the base game tutorial and Warlords scenarios, you may uninstall them respectively. Colonization is a standalone game which does not overlap with Beyond The Sword. 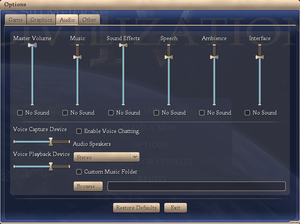 A very thorough set of instructions on how to install Civilization IV and its expansions are available here. Change 'NoIntroMovie' from 0 to 1. See the WSGF page for a fix. No option, but can be forced with external utilities. See Borderless fullscreen windowed. 18 Non-Steam versions require a GameSpy ID. To ensure the original game and its expansions run properly, install the latest DirectX End-User Runtimes. This is not a problem with the Complete Edition, which installs the correct DirectX version automatically. Caused by discontinued support for Python 2.3 in OS X Yosemite 10.10. Copy the folders '2.3' and '2.5' to /Library/Python/. Enter your administrator password. Go to /System/Library/Frameworks/Python.framework/Versions/ and delete the alises for '2.3' and '2.5' and copy in the '2.3' and '2.5' folders from the BTS Yosemite Python Fix. 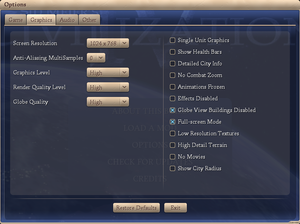 ↑ 2.0 2.1 This path is used by the GOG version of the game. Retail and Steam use the complete name of the game. ↑ 3.0 3.1 File/folder structure within this directory reflects the path(s) listed for Windows and/or Steam game data (use Wine regedit to access Windows registry paths). Games with Steam Cloud support may store data in ~/.steam/steam/userdata/<user-id>/3900/ in addition to or instead of this directory. The app ID (3900) may differ in some cases. Treat backslashes as forward slashes. See the glossary page for details.